January 26, 2017	/ 6:30 P.M.
Ōkawa Shūmei is generally known for his involvement in the Japanese right-wing movement that led to his arrest after the “Incident of May 15” in 1932. Ōkawas activities after his release from prison in 1937 until his indictment as a war criminal in 1946 have not been explored widely. Ōkawa studied in the department of religion at Tokyo Imperial University. After his graduation in 1911 he became involved in the Pan-Asiatic Movement that was connected to right-wing groups. In the aftermath of World War I Ōkawa, like many others in Japan, became convinced that his country could only be saved by urgent social and political reforms. He therefore connected with Kita Ikki (1883-1937) and others to form a movement that was plagued with split-ups and achieved little. 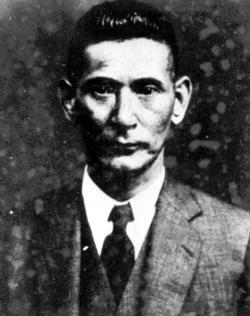 Initially being sentenced to 15 years in prison for his involvement in the plot of 1932, he was released after the outbreak of the Sino-Japanese War. To prepare the Japanese advance into Southeast Asia Ōkawa established a private academy to train specialists for the region, while simultaneously working on plans to end the war in China and prevent the impending conflict with America. Ōkawa was a prolific writer who covered diverse topics, including religion, Asianism, the Indian independence movement, colonial history, Japanese history and the “Japanese spirit”. This talk will summarize Ōkawas life, his thinking and his actions against the background of his times. In this context it will also explore the Japanese ideological concept of the “national essence” (kokutai), the tensions between collectivism and statism (kokka shugi) vs. individualism, and political utopianism in the Japanese far right before 1945. Florian Neumann teaches at Kagawa University in Takamatsu (Shikoku). In 2011 he published his doctoral thesis, which examines the political thinking of the right-wing constitutional professor Uesugi Shinkichi (1878-1929), Politisches Denken im Japan des frühen 20. Jahrhunderts: Das Beispiel Uesugi Shinkichi (München, Iudicium). He also published articles on utopian ideology by Japanese thinkers of the far right before and during World War II, including Satomi Kishio (“Die kokutai-Wissenschaft von Satomi Kishio (1897-1974)”, OAG Notizen, 02/2014) and Ōkawa Shūmei (“Ōkawa Shūmei und der Weg zur „Shōwa-Erneuerung”, OAG Notizen, 02/2015; “Ōkawa Shūmei und Japans Krieg in Ostasien”, OAG Notizen, 11/2015). He is currently working on a two part article on the historian Hiraizumi Kiyoshi (1895-1984).